Although Dahlia are half hardy perennials they are normally grown as a half hardy annual by gardeners. Depending on the variety they flower from the middle of summer to the first frost of winter. Bigger varieties of Dahlia can reach heights of 1.5 metres and carry double flowers in a large range of colours. Dahlia (tiptoes) pictures by KaCey97007. 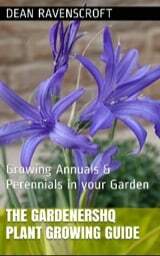 Life Cycle: Half hardy perennial usually grown as a hardy annual by gardeners. Height: 12 to 60 inches (30 to 180 cm). Native: South and Central America. Flower Details: Purple, violet, yellow, red, pink, white. May have large flowers. Often have double flower heads. Sow Outside: Tubers: plant about 6 or 7 inches (15 to 18 cm) deep with the eye at the top following the last frost. Seed: Cover seeds. Two weeks before last frost. Spacing: small species: 12 inches (30 cm); larger species 20 to 36 inches (50 to 90 cm). Sow Inside: Pots. Germination time: one to three weeks. Temperature 68°F (20°C), ten weeks in advance. Transplant outdoors in mid spring, well after any chance of frost. Requirements: Full sunlight. Soil pH 6 to 7.5. Deep soil. Humus rich. Add bone meal. Low nitrogen. Provide support. Occasional feed with bone meal. Pinch tips. Deadhead. Bring tubers indoors for the winter in areas of frost. Propagate: dividing in autumn. Dahlia can be grown from either seed or tubers. 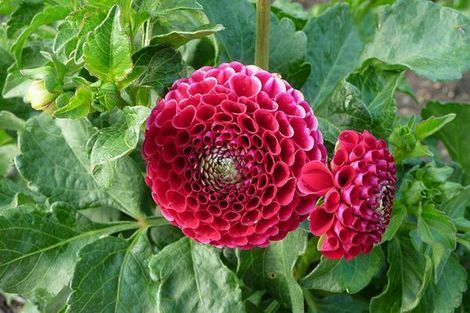 If growing from tubers then plant with the eye towards the surface at a depth of about 15 cm (after the last frost of spring); the seeds of Dahlia should be lightly covered once sown (before the last frost of spring). 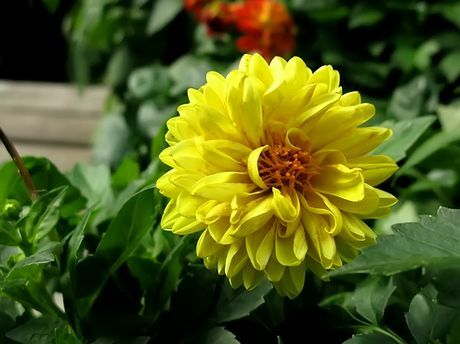 Ideally Dahlia should be planted into an area of the garden that is sunny; spacing depends on variety, small (30 cm), medium (45 cm), large (65 cm). They like a soil that is of pH6 to 7.5, and that is enhanced by the addition of bone meal and humus, and low in nitrogen. Seedlings of Dahlia can first be grown indoors for later transplanting. They should be started about 10 weeks before they are due to be put outside in the middle of spring. They normally takes from one to three weeks to germinate in individual pots at about 18°C. Dahlia Chick A Dee by F. D. Richards. 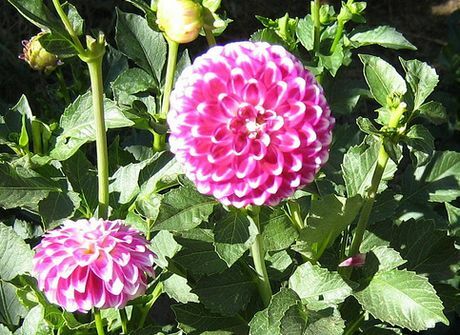 Once growing in the garden Dahlias should be fed by the use of bone meal at the beginning and end of summer. Dahlia should be watered in prolonged dry periods, and weekly when in bloom.